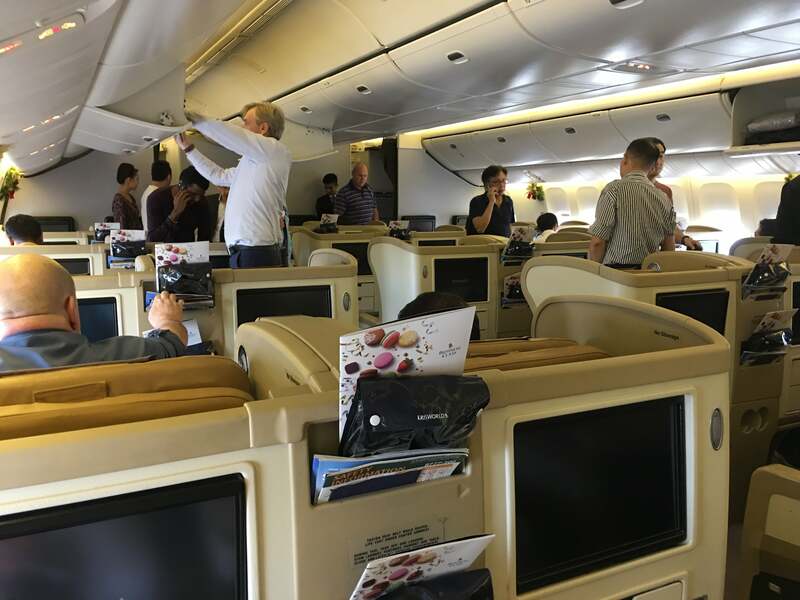 Ever wondered why we’re stuck with 2-2-2 configured Business Class on medium haul routes to Japan and Australia? Here’s a short history lesson in an otherwise vanilla SQ Regional J review! 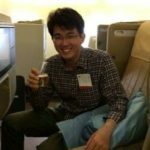 Is there a point in putting out another review of SQ’s regional business class? You’d have to be a creative genius to put a fresh slant on this product. 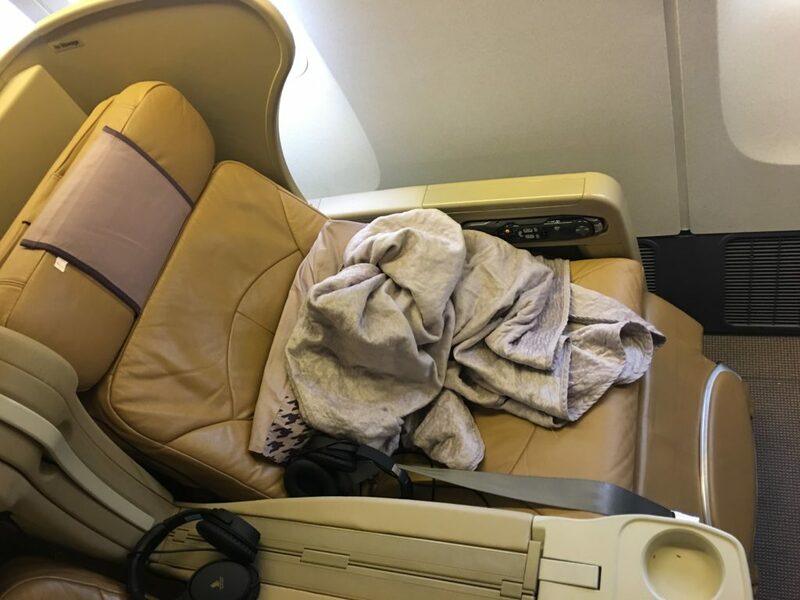 A little perspective here though; these Weber 7811 seats manufactured by Zodiac Aerospace actually only debuted in February 2009 with the delivery of the A330-300 to Singapore Airlines, so they are actually newer than the 2006 Business Class still seen regularly on some long haul flights. A short history lesson: the B772s and A333s currently plying regional routes were ever only intended as a stop-gap while awaiting the more fuel efficient B787 and A350. At that time, the plan was to phase in the new generation of aircraft by 2011. They must have been deluded if they thought those planes would be rolled out on schedule; developing and manufacturing a new aircraft is no walk in the park, and both programs were plagued by delays. The 2011 target flew by, and SQ had to order 11 more A333s in that year. Those additional aircraft made the A333 the second largest SIA fleet with 22 aircraft in service, only falling behind the long haul B77W. 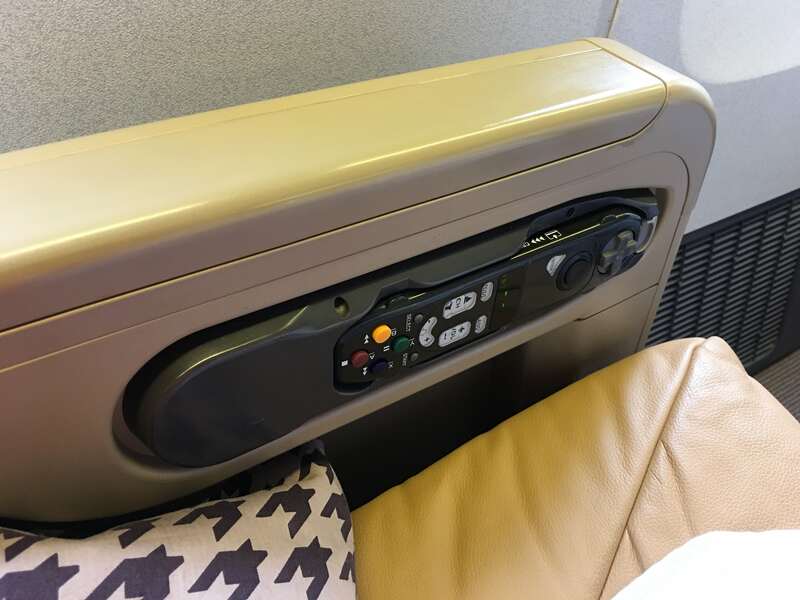 While it won’t win you any awards, the Weber 7811 seat is better than the previous regional J offerings, and it was retrofitted on some of the older planes, including the B777 that I was scheduled to fly on. We are only seeing the introduction of the Dreamliners and A350s recently, so we’ve been stuck with the current stable of aircraft for regional travel until now. For all the shade that people throw at it now, I really feel that this isn’t all that bad a hard product. For the 3-4 hour, daytime flights that it usually flies, it is more than comfortable enough to get some work done, and relax a little before going back to the grind. Its only fault is that in an increasingly competitive commercial aviation industry, 2-2-2 angled flat just wasn’t going to cut it against 1-2-1 full flat products. 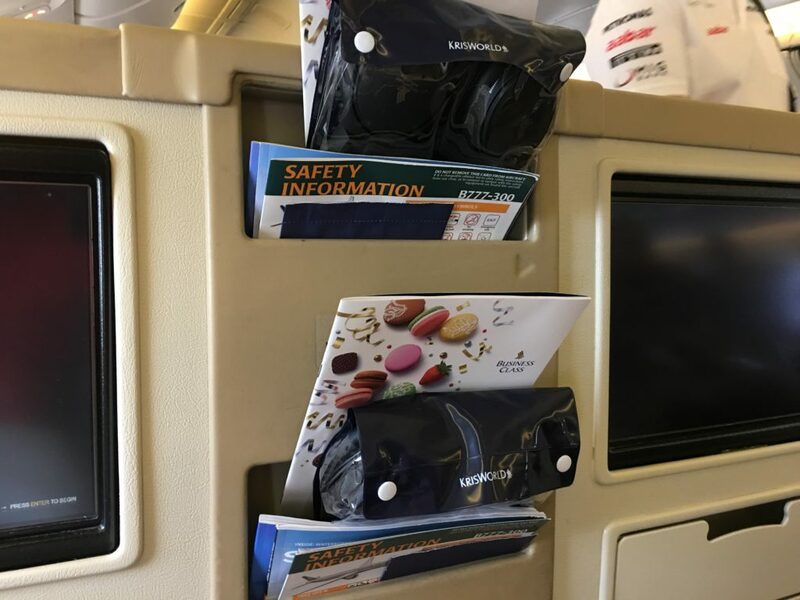 However, you see this product being operated on medium haul flights of 5-7 hours to Korea, Japan and Taiwan, comparisons are bound to be made. JAL and EVA Air operates awesome products on these popular routes, so SQ really needs to up their game there. All that being said, if you look back to the old FlyerTalk threads when this product was first released, it is amusing to read how people gushed about how ‘I can’t believe this is a regional J product!’ How times have changed. Well, for a short hop from MNL to SIN, I had no complaints. I was getting some work done in the MNL SilverKris lounge, and only made my way to the aircraft pretty late. 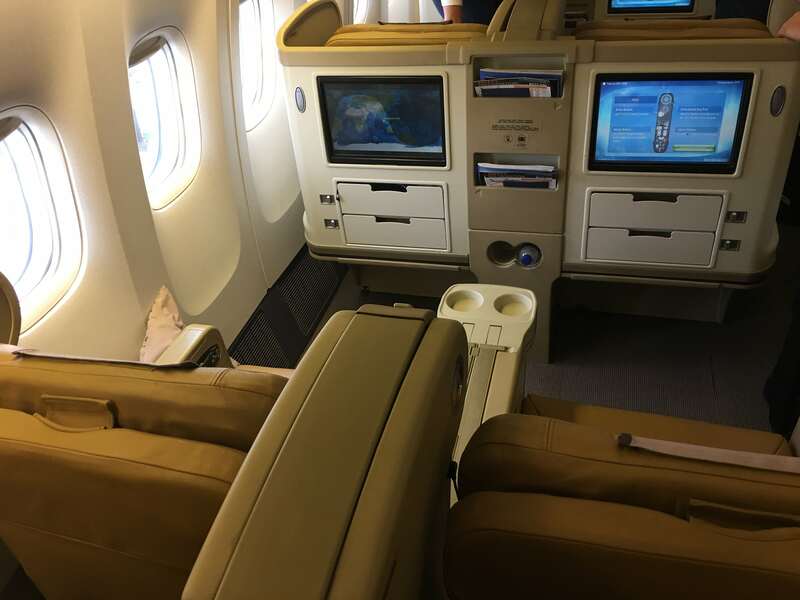 The Business cabin on the B773 is a relatively large, single cabin with 50 seats. It was almost completely full; so the cabin was bustling with activity at boarding with quite a bit of shoulder bumping and ducking out of the way as everyone tried to get their carry-ons into the overhead bins. I have included some customary photos of the seat below, but really this is just old news. 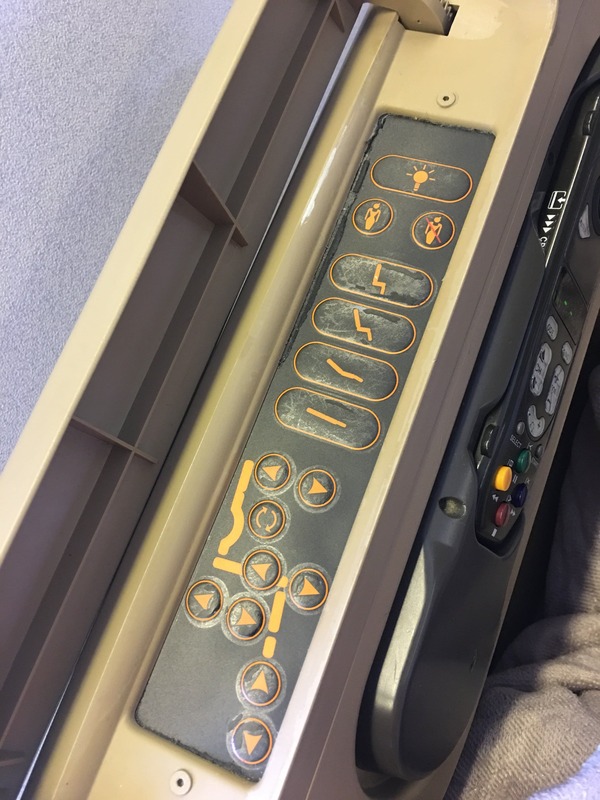 The only thing to note in the B773 cabin is the lack of a window for row 17, but that’s readily available information on SeatGuru. The menus and noise-cancelling headphones were unceremoniously stuffed into the storage pockets in front of us. 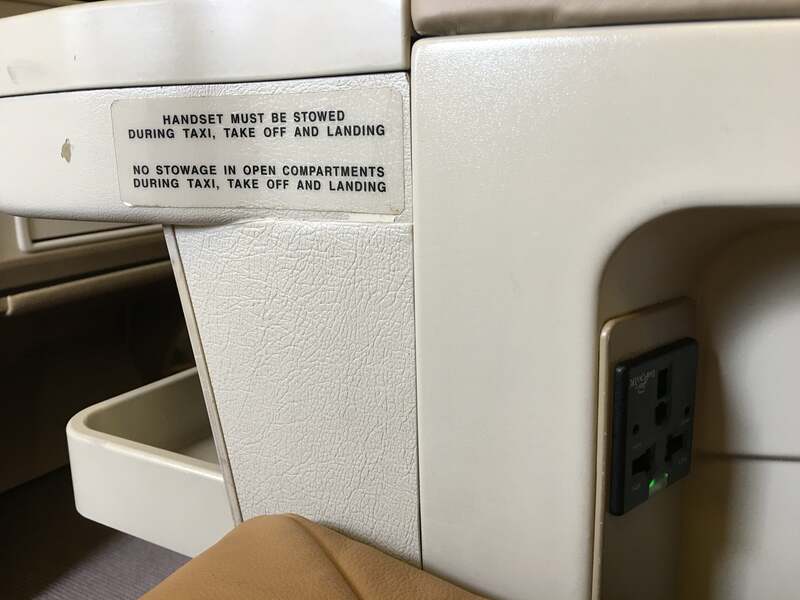 Call me a noob, but I’ve actually never noticed cause I’ve never flown alone on this product before, but there’s a little arrow embossed below these storage pockets to indicate that the top belongs to the seat on the right, whereas the bottom belongs to the left. You learn something new everyday! Noise-cancelling headphones and other material. Top belongs to the seat on the right! 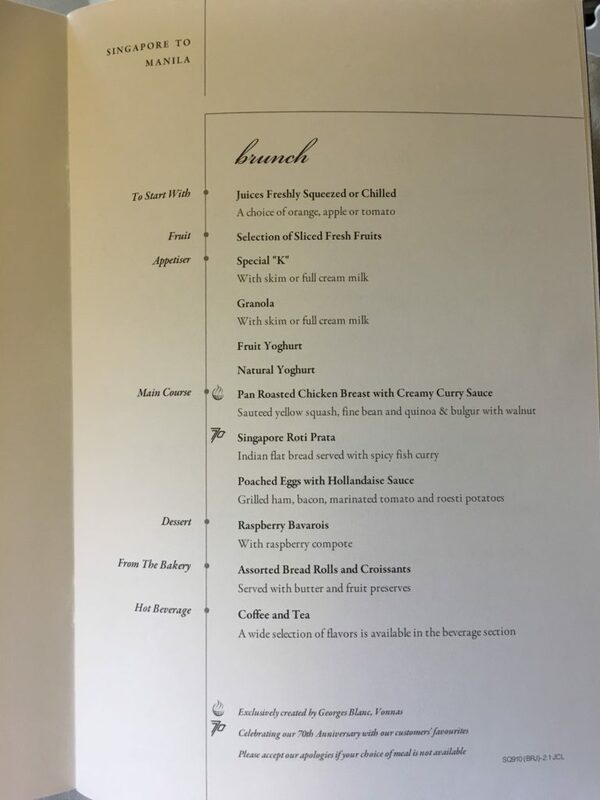 There is no Book the Cook service out of MNL, so what you see on the menu is what you get. 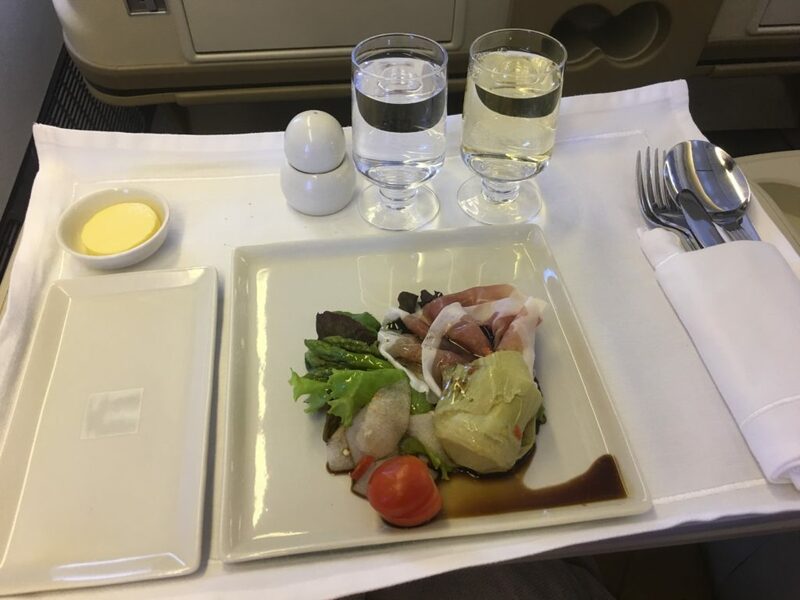 I think that the BTC service is an excellent idea, in that you are promising passengers a degree of consistency with their meal – they know what to expect instead of hoping that at least one of the 3 meal options would appeal to them. This is definitely the case ex-SIN, but when departing out of other cities the meals are very, very variable. Anyhow, that was a moot point for this flight, and I chose the Grilled Chicken in the end. It was acceptable. 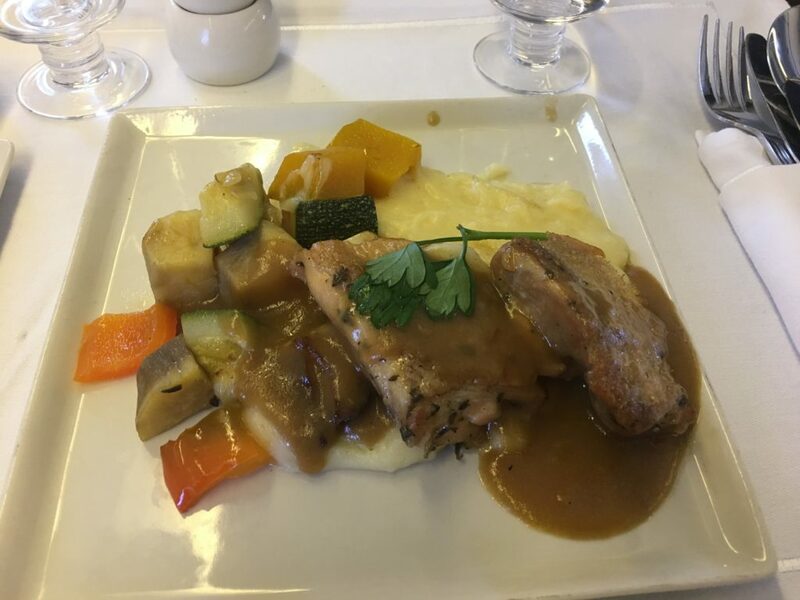 I wasn’t expecting to be wowed of course; its definitely better than what you’d get in Economy, but this was remarkably similar to the Teriyaki Chicken I had at Yoshinoya just before I started writing this article. 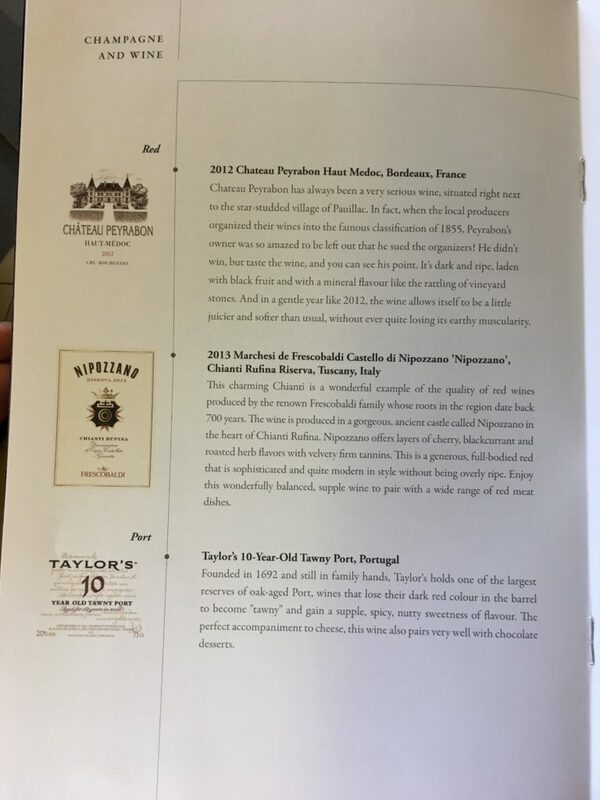 For those of you keeping track, I have also included the wine list. If my memory serves me correctly they seem to have swapped out the Riesling from Mosel for one from Rheingau. I’ve always thought they went with Mosel for its high acidity to make up for the muted palate at altitude, but I suppose this one must have made it pass the bar as well. Anyhow, both regions are excellent (albeit different) producers of this grape. 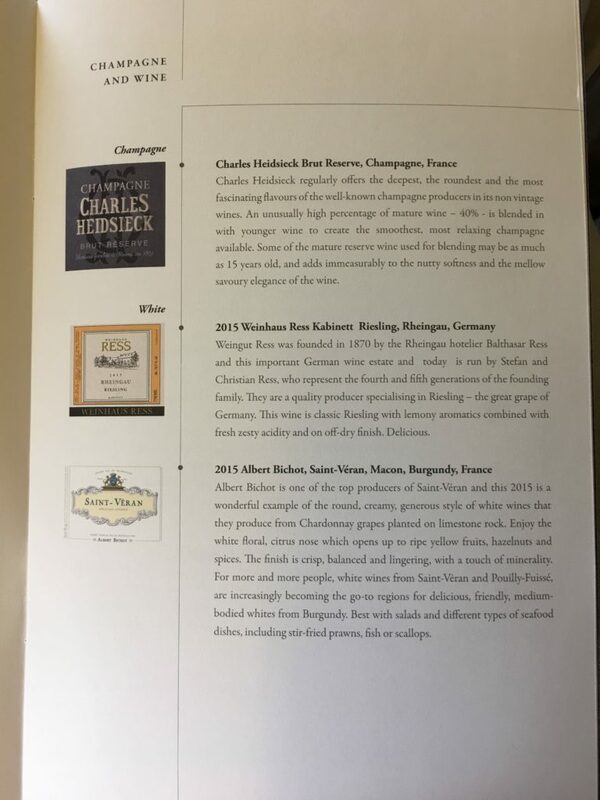 Charles Heidsieck Brut Reserve is now the bubbly on offer in J. There was not much time for anything else as the Captain made the announcement of the approach into Singapore. I didn’t even get my dessert! Hmm…. 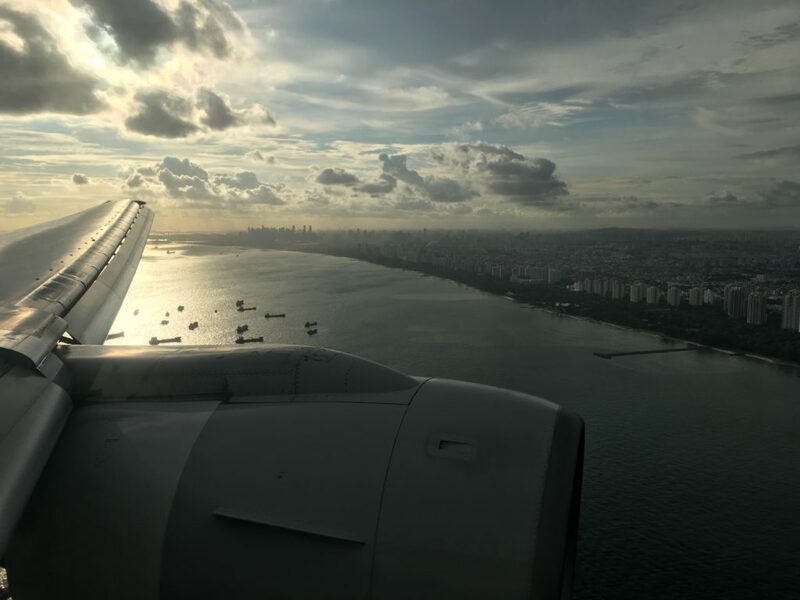 I do love it when the aircraft makes its approach into SIN from the south; it makes for beautiful views of the southern coastline of Singapore (as opposed to just catching a glimpse of Tekong). Correct me if I’m wrong, but I think this is decided primarily by the prevailing monsoon winds. It was only a short 4 days back at home before my next trip to BKK, and I couldn’t wait to visit the new CX lounge in T4, as well as try the reverse herringbone J on their A350. Was this flight worth the miles spent? From a cent per mile point of view, because I tagged this to my subsequent trip to PER using the $100-ticket trick, it was well within the ‘good value’ range of about 5+ cpm. From an experiential point of view, regional J really is just… boring vanilla. That being said, one of the basic rule of this game is ‘earn and burn’. With the constant spectre of devaluations looming, it can be painful to keep miles for that elusive big redemption only to have it cruelly tugged out of reach each time. To that end, there’s really no hard and fast rule! I was happy with my redemption, and that’s what matters ultimately. Stay tuned for the subsequent reports to come! MNL SKL is pathetic, doesn’t even have fruit juices and food selection is anemic. 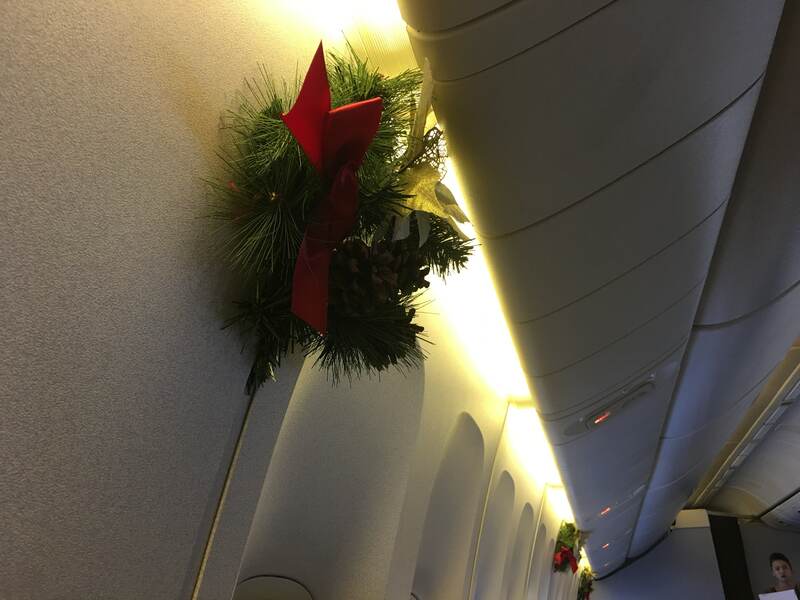 In this busy Christmas season, the in-MNL flight made more sense and value as an award redemption for me. 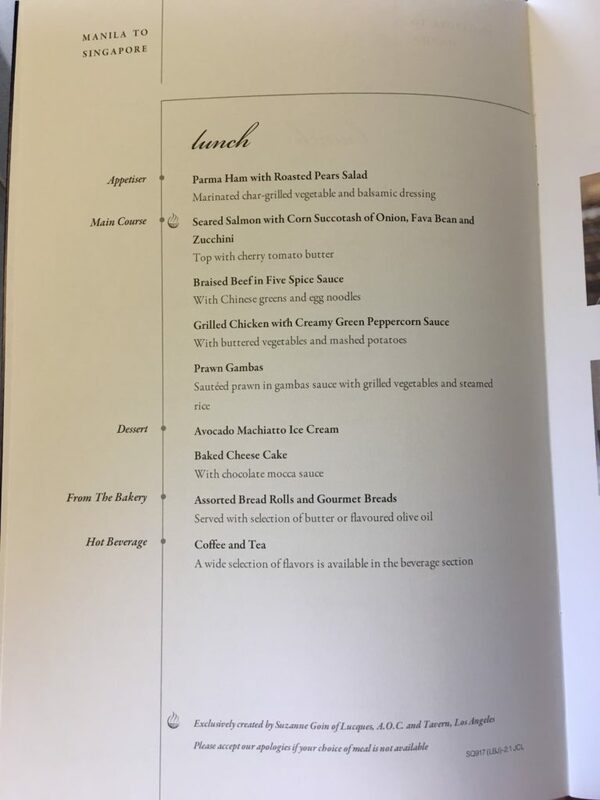 Any other flight even in economy was a factor more expensive. I presume you booked this with the Spontaneous Escapes promotion? If so then congratulations, you would’ve managed to get an approx. 8cpm value out of this one-way, like I did. Nope, but I tagged it to another flight to PER later in 2018, paying 32.5k miles and $100 for a stopover in SIN. Hey Jeriel, you mentioned about the $100-trick. Did you do it with SQ or CX? Because you were talking about trying out the CX lounge earlier. If CX does have $100-trick, would you be able to cover it in one of your post? ? That’s odd.. DUS SIN SYD is a valid route as per the award chart at 105k miles one way.. Yes, that’s the same number I dial when calling SQ (via Skype). Exactly. The agent had no clue what I was talking about…..